L-R: Sanjeev Ranjan, Managing Director International Copper Association India, Shreegopal Kabra, Managing Director RR Global, Punit Agrawal, Chief Project Manager (Systems), National High Speed Rail Corporation, Vijay Karia, Chairman & Managing Director, Ravin Group, Subhash Desai, Honorable Minister for Industries and Mining, Government of Maharashtra, Vikas Ganpat Sonar, Vice President, Adani Electricity Mumbai Limited, Mumbai Transmission Business, Bhupendra Chaubey, Senior Journalist, Milind Kumar Deshmukh, President, National Association of Fire Officers (NAFO), Ashish Khanna, CEO, TATA Power, Renewables, Ajit Sharma, Executive Director, Mumbai Railway Vikas Corporation Ltd.
PCA Launch was preceded by a panel discussion on the theme - Building Safe, Reliable and Efficient Electrical Infrastructure in India. The panel discussion was moderated by leading Sr. Journalist. Panelists were from Fire Safety Officers Association, Tata Power, Adani Power, Mumbai Rail Vikas Corporation & Cable Manufacturers. Delegates in audience were drawn from Power Cable industry, Real Estate, Railways, Metro rail apart from fire safety champions, industry experts and academia. Today, India witnessed the start of a movement for quality infrastructure with the launch of Power Cable Alliance (PCA). 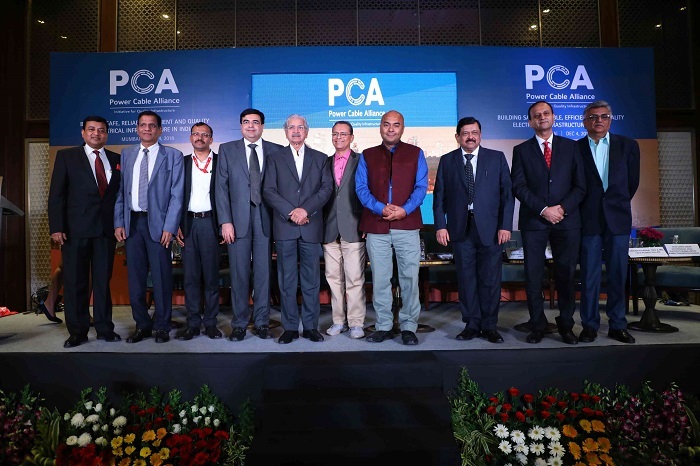 Two Copper Rod Manufacturers, Eight Indian leading Power Cable manufacturers & One International Power Cable entity – have come together to form PCA.